The master storyteller at his best delivers a generous, thrilling new collection of stories featuring revelatory autobiographical comments on when, why and how he came to write each story. 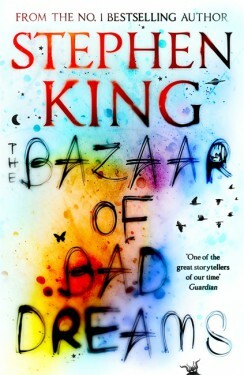 In The Bazaar of Bad Dreams there is a curio for every reader – a man who keeps reliving the same life, repeating the same mistakes over and over again, a columnist who kills people by writing their obituaries, a poignant tale about the end of the human race and a firework competition between neighbours which reaches an explosive climax. There are also intriguing connections between the stories; themes of morality, guilt, the afterlife and what we would do differently if we could see into the future or correct the mistakes of the past. Effervescent yet poignant, juxtaposing the everyday against the unexpected, these stories comprise one of King’s finest gifts to his constant reader as well as to those fascinated by the autobiographical insights in his celebrated non-fiction title On Writing. Includes ‘Cookie Jar’, a story new for this edition and ‘Obits’, winner of the 2016 Edgar Award for best short story.